Posted in FPMT News Around the World, Mandala. Ven. Roger Kunsang and Ven. 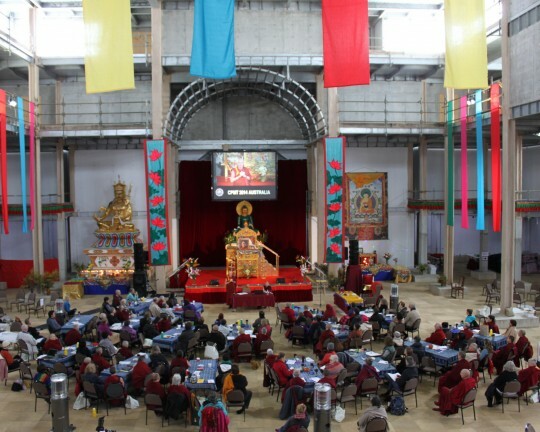 Holly Ansett during a presentation on Day 4 of CPMT 2014, Great Stupa of Universal Compassion, Victoria, Australia, September 16, 2014. Photo by Laura Miller. Day 4 of the CPMT 2014 meeting began with Lama Zopa Rinpoche leading the morning motivation in the Great Stupa of Universal Compassion. (A video recording of this is available on the CPMT Livestream page.) It was the perfect start to a busy and chilly day. After breakfast, the North America regional coordinator Drolkar McCallum shared her experience with the Inner Job Description (IJD), explaining how she’s “fallen in love” with doing the practice. She then led participants through a short reflection on listening, part of the developing skillful communications section of the IJD. Vens. 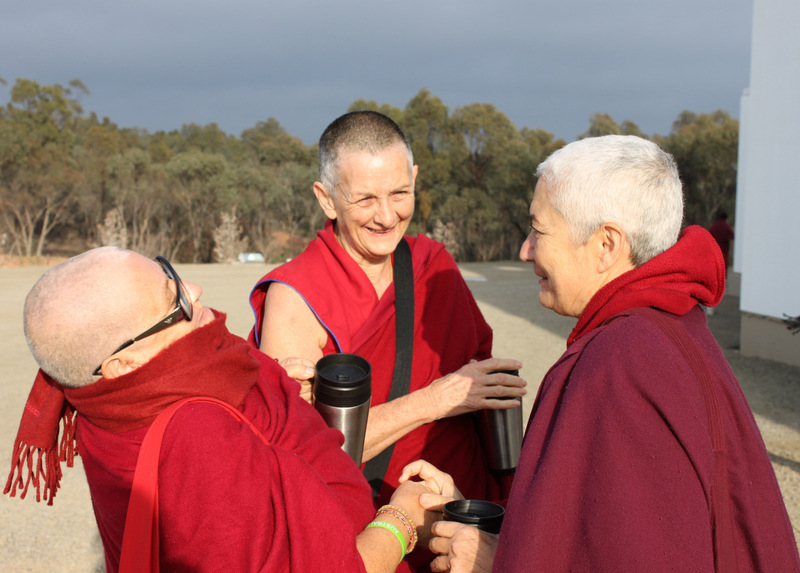 Siliana, Trisha and Paloma outside the Great Stupa of Universal Compassion, Australia, September 16, 2014. Photo by Laura Miller. Ven. Roger Kunsang, CEO of FPMT, and Ven. 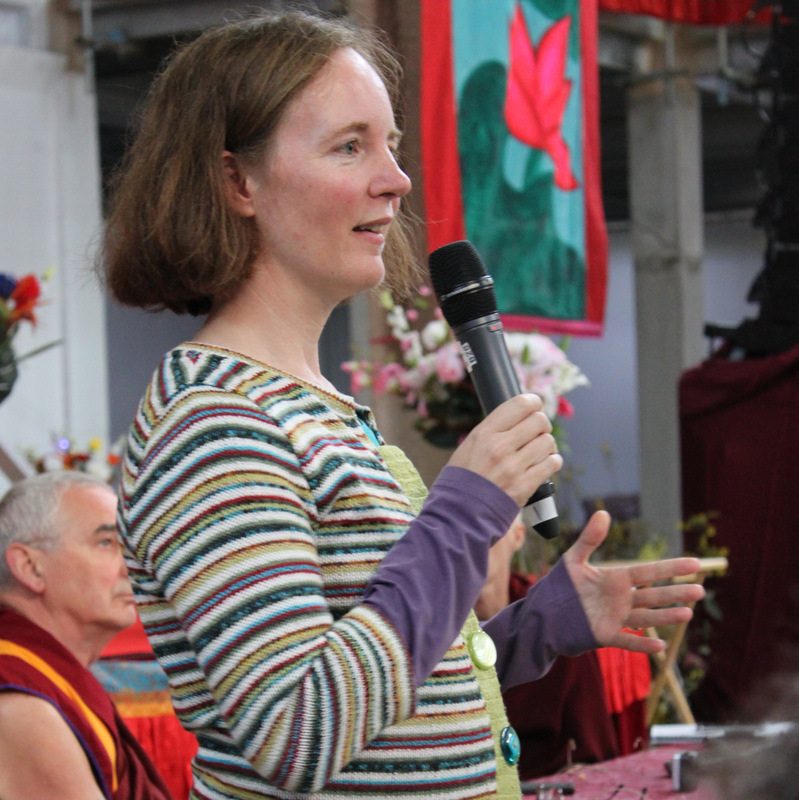 Holly Ansett, FPMT charitable projects coordinator, spoke on Lama Zopa Rinpoche’s Vast Visions and the Five Pillars of Service. “The organization is about giving value or meaning to an individual’s life — giving us a clear understanding of our purpose of being,” Ven. Roger said as a way of orienting his presentation. “That’s what we do. That’s who we are. You can’t underestimate it. And I haven’t found anything better to do. The difference we’ve made in the world up to today, I’d say, it’s huge.” Lama Zopa Rinpoche arrived as Ven. Roger talked about the importance of Lama Yeshe and Lama Zopa Rinpoche to the work of FPMT and the importance of everyone offering service to FPMT and to the Lamas. Linda Gyatso speaking on Day 4 at CPMT 2014, Great Stupa of Universal Compassion, Australia, September 16, 2014. Photo by Laura Miller. Ven. Holly Ansett presented Lama Zopa Rinpoche’s Vast Visions for FPMT, describing the story behind it and its development with Rinpoche adding in commentary throughout. Ven. 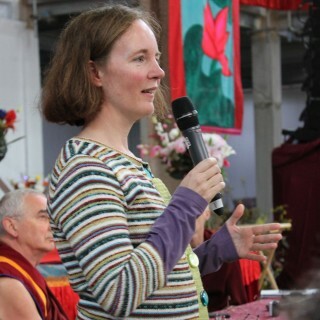 Holly described how much amazing work has already been done to actualize Rinpoche’s expansive wishes. Linda Gyatso, the new director of the Foundation for Developing Compassion and Wisdom, introduced the organization. Linda explained that FDCW helps to develop and promote Universal Education for Compassion and Wisdom, the secular education programs and initiatives that have grown out of a vision articulated by Lama Yeshe. He explained that this isn’t new in the sense that many centers, projects and services are already engaged in many of these pillars. Francois Lecointre, director of Institut Vajra Yogini (IVY) in France; Denise Macy, director of Land of Medicine Buddha (LMB) in California, US; and Fabienne Pradelle, director of Vajrapani Institute in California, explained how the work of their respective centers matches up with the Five Pillars. Wendy Cook, Ven. Lindy, Matthew Poxon during tea break on Day 4 at the Great Stupa of Universal Compassion, Australia, September 16, 2014. Photo by Laura Miller. Hup Cheng Tan, center director of Amitabha Buddhist Centre in Singapore, explained how ABC makes extensive offerings, hosts festivals and creates many, many activities for students to make offerings and to offer sponsorships. For many present, the scope and results of ABC’s activities were mind blowing. Hup Cheng also mentioned that ABC has a retail shop and used feng shui when designing their building, but emphasized that generosity and merit generation were at the heart of their revenue generation work. 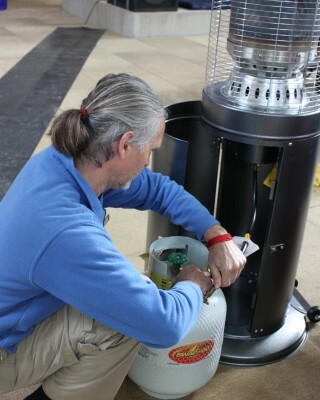 Harald Weichart helps change the fuel for the space heaters at CPMT 2014, Great Stupa of Universal Compassion, Australia, September 16, 2014. Photo by Laura Miller. Tony Steel, center director of Vajrayana Institute, Sydney, Australia, explained how the center started to organize and host large conferences as a form of revenue generation, specifically “Happiness & Its Causes,” which has had His Holiness the Dalai Lama as a featured speaker, and also the conference “Mind & Its Potential.” Tony explained that he has drawn on his background in business while leading the center’s work in this area. As a way to evolve, Vajrayana is trying a new initiative: organizing exhibition events that generate money through selling sponsorships and exhibition space. They are currently working on one focused on wellness. Sarah Brooks, spiritual program coordinator of Kadampa Center in Raleigh, North Carolina, US, explained how Kadampa Center operates on a donation only basis. She explained that at first the center tried raising funds by asking for a specific donation at events, but now they have no suggested donation, letting attendees decide their level of contribution. They also offer opportunities to sponsor teachers, pujas and holy days. Since they’ve moved to this model, they have been receiving more donations than before. The center also encourages students to set up a regular, automatic monthly donation, instead of trying to raise money with once a year type fundraising campaign. The center also makes sure to emphasize the practice of generosity and to show sincere gratitude to donors and active community members. Ven. Holly was then invited to briefly list all of the incredible merit-generating activities that are being done through the FPMT Puja Fund. All present took a moment to rejoice in the beneficial activities being supported by this fund. 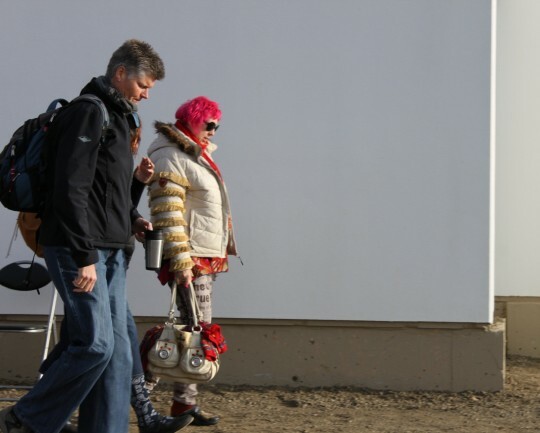 Jane Willis and Miffi Maximillion from Langri Tangpa Centre outside of the Great Stupa of Universal Compassion, Australia, September 16, 2014. Photo by Laura Miller. At this point, the session was opened up to questions and sharing from the audience. Andy Wistreich from Land of Joy, a project to create a retreat center in the UK, announced that the project is completing the purchase of the property that they had found in northern England. In July 2014, Rinpoche visited and blessed the land. “You create the merit and the money will come,” Andy explained. “It’s very important to not worry about money; worry about merit.” He continued that if you or your center asks Rinpoche a very specific question about creating merit for your project, you will get very specific advice. And if you properly carry out the advice, the money will come. He also said that Land of Joy hopes to employ a generosity model. Denise Macy, from LMB, described some of her experiences with undertaking large projects and talked about a recent fundraising campaign. Members of the LMB community turned their very large prayer wheel continuously for 24 hours and exceeded their fundraising goals. She emphasized the importance of a “can do” attitude and a willingness to take a risk. Ven. Chantal Carrerot and Drolkar McCallum leading a presentation on International Mahayana Institute with Lama Zopa Rinpoche listening on, CPMT 2014 Day 4, Great Stupa of Universal Compassion, Australia, September 2014. Photo by Laura Miller. Miffi Maximillion, spiritual program director of Langri Tangpa Centre in Brisbane, Australia, explained the center’s popular “prostrate-a-thon,” in which participants took pledges for doing prostration for world peace. She said they saw the event primarily as a merit raising event and had “heaps of offerings” in the center during the event. In addition to creating merit, Miffi said the event also created a great community feeling. Ven. Chantal Carrerot director of International Mahayana Institute (IMI) and Drolkar McCallum led a presentation on IMI, the community of FPMT’s monks and nuns. Ven. 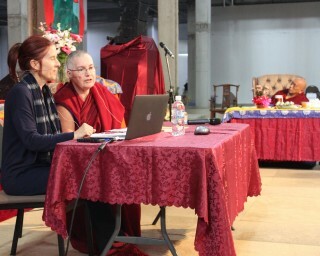 Chantal described the more than 40-year history of IMI and their invaluable contribution to building the international FPMT mandala; they were the “pioneers.” As of today, IMI had 280 Sangha members in 29 countries who are in retreat, studying, teachings and offering service. 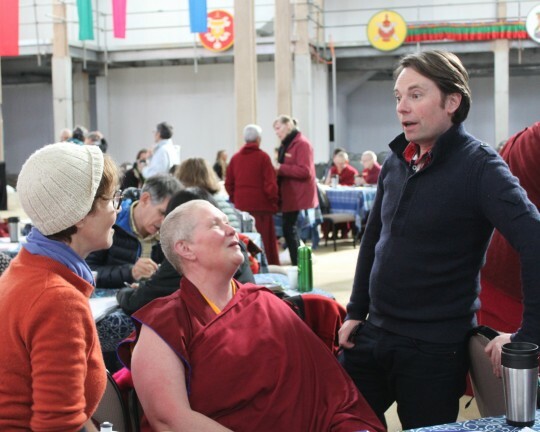 Participants talked with partners at their tables about the centers, projects and services that they knew of that have benefited from Sangha involvement. There were no shortage of instances to discuss. Then everyone took a few minutes to rejoice in all the activities of IMI Sangha members. Drolkar then described current and future projects to support Sangha, drawing attention to the Lama Yeshe Sangha Fund. Afterwards, small groups gathered to discuss issues on Sangha and reported back to the large group. IMI Sangha members meeting with Rinpoche during the small group discussion period at CPMT 2014 Day 4, Great Stupa of Universal Compassion, Australia, September 16, 2014. Photo by Laura Miller. Drolkar also led the end of day reflection, asking participants how they did with their practice of listening. “Was your listening unbiased? … Was it patient? … Did you listen with interest?” she asked. 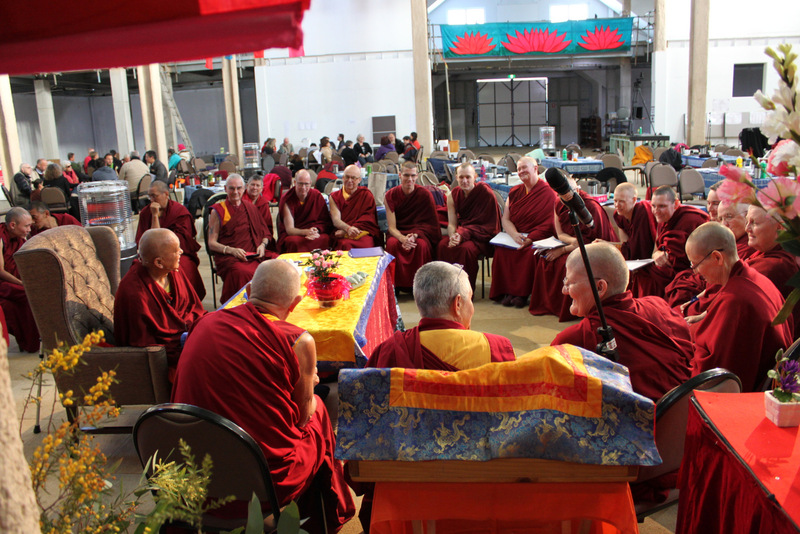 Lama Zopa Rinpoche, who had observed in most of the day’s meeting, led the dedication. After dinner, Ven. Paloma Alba and Gun Cissé shared their stories about meeting the Dharma as part of the evening’s Wisdom Culture program. Like previous evenings’ presentations, despite the draft and chill in the stupa, their stories warmed the audience with laughter and inspiration. Ven. 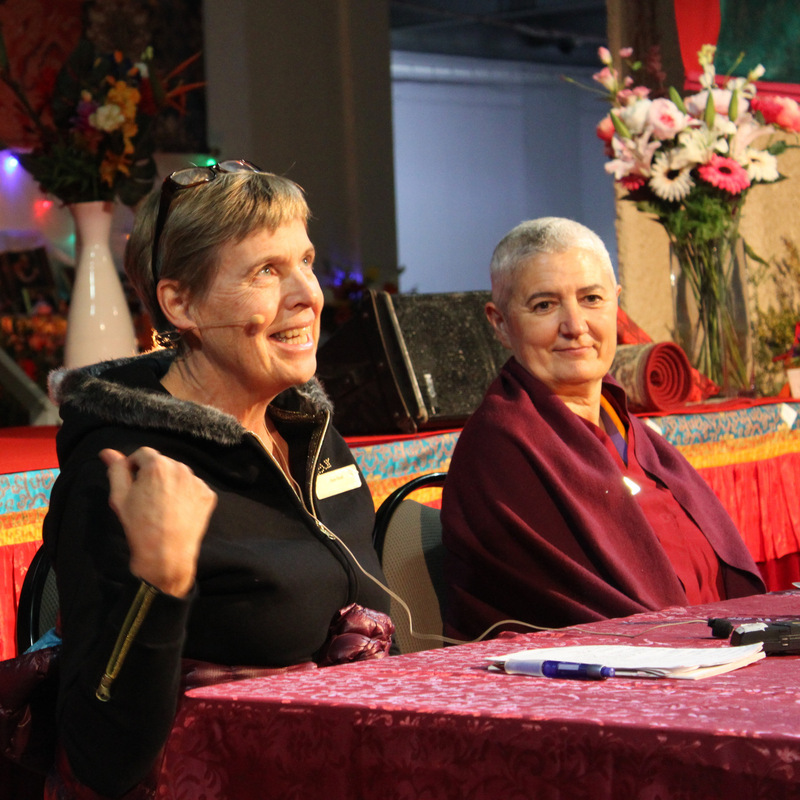 Paloma and Gun Cissé sharing their stories of meeting the Dharma, Day 4 CPMT 2014, Australia, September 16, 2014. Photo by Laura Miller. Mandala will continue sharing updates and photos from the CPMT 2014 meeting as the meeting continues.